Floyd Lawton lives by a simple code: do the job that you're hired for with the least amount of causalities possible- after all, you're not being paid to waste bullets. This lethal DC supervillain doesn't play around. He hits his target on the first shot always, hence his name, Deadshot. It doesn't matter what kind of weapon is in his hands- assault rifle, wrist mounted machine guns, or Harley's revolver- Deadshot never misses. The Suicide Squad should be thankful to have the expert marksman on their side. Even though Deadshot isn't too happy to be a part of Amanda Waller's mission, he'll do whatever she needs if there's a possibility that he can see his daughter again. Are you ready to don the mask and turn into the famed gun for hire? 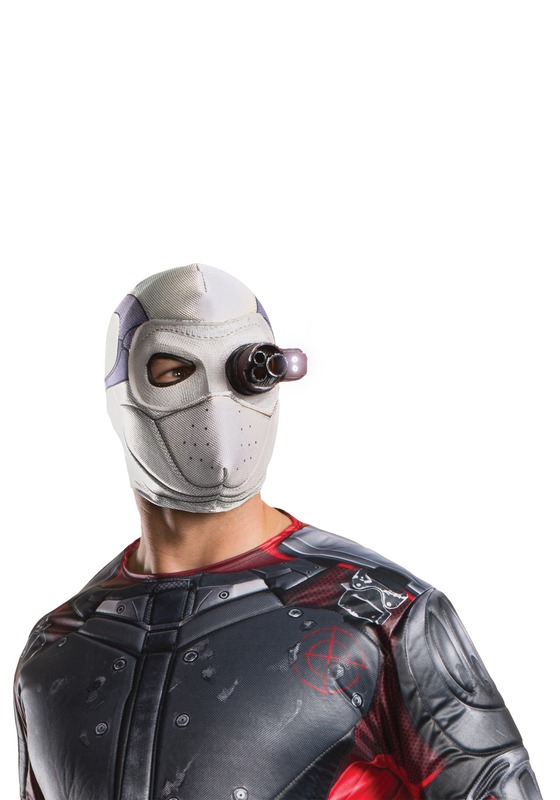 This officially licensed Deadshot mask is a full coverage mask that will help to conceal your identity while you become the notorious hired assassin and front man of the Suicide Squad. This mask features a cybernetic eyepiece that really lights up, so you can lock the Enchantress in as a target right away. Pair this costume with a Deadshot costume and meet up with Harley and the rest of the Suicide Squad. Remember, complete the mission and you'll be one step closer to getting what YOU want.